4,75 stars. I used to have this as a three star read, because I read it back in the day when I still rated books on one big scale. Nowadays I realize that there's no point in comparing "fun" books with "serious" books because I read them for completely different reasons. It's like trying to use the same criteria for rating a cheesecake and a pizza, just madness. 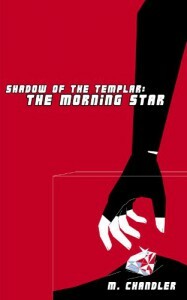 What I love about The Morning Star are the characters, the world, and the writing. Even with all the ridiculous jamesbond-esque gadgets Shadow has, or the way team Templar seems to be able to bend the law to suit themselves, the writing is just so good that I don't really pay attention to any of that. The author can sell it to me, which is all that matters. These books are so much fun, even when they take a turn for the serious, and I'm going to be continuing on to the next one right after I've finished reading all the extras between Morning Star and Double Down.